WILMINGTON — Boat owners with slips at Wilmington’s Colonial Yacht Anchorage have been on the move since finding out that the marina’s owners were evicted from the Port of Los Angeles property effective March 1. After 63 years, Colonial Yacht Anchorage — owned and operated by the San Pedro-based Camello family — closed its doors for good, following a years-long effort to keep the company afloat through rough economic times. The eviction caught many of the area’s slip tenants by surprise, as they awoke March 1 to zip-tied signs posted at the docks by the Port of Los Angeles’ Harbor Department informing tenants that the marina was to be operated by the port until a new manager could be identified, and the long-term use of the marina could not be determined. Since then, the 50 remaining tenants at the 138-slip marina at Wilmington’s Berth 204 along Anchorage Road have been in limbo, wondering what is to become of their slips. After seeing the notice, Colonial Yacht Anchorage liveaboard Tracy Cook began looking into the situation and found a Request for Proposals on the port’s website for interim managers at the marina — which he believed showed that Parcel #7, the slips along the harbor’s main channel, would be removed, while Parcel #1, along Wilmington’s inner channel north of the main channel, would be safe. Cook, who had been a Colonial Yacht Anchorage tenant for years, immediately contacted the Harbor Department to express his concerns regarding the many liveaboards and elderly boaters in the marina that would have trouble relocating on the port’s terms. According to Los Angeles Deputy City Attorney Janet Karkanen, Colonial Yacht Anchorage had not paid rent to the port for two years and had filed for bankruptcy twice. A court judgment from Los Angeles Superior Court had been handed down that essentially handed all of Colonial’s assets, including the marina and boatyard, over to the Port of Los Angeles. “After evaluating the premises and seeing the current condition of the marina, the port decided that the prudent thing to do would be a complete closure of the marina and to vacate all of the slips,” Karkanen said. “Right now, we are working with vessel owners to meet the May 1 deadline, and the liveaboards are our primary concern,” Karkanen said. Next door, Shannon Quick — who operates Cerritos Yacht Anchorage — was approved by the port to act as interim manager of Colonial until all of the slips are vacated, which is scheduled to occur May 1. Cerritos Yacht Anchorage was founded in 1942, when Quick’s father-in-law, Eddie Rimkus, started the business. It has been family owned ever since. Quick said the marina was handed over to Cerritos, and the company has been on a mission to track down each boat’s owner and find out how best to relocate the vessels and liveaboards. After the slips are emptied, the future of Colonial Yacht Anchorage appears to be in doubt. The port has found the marina’s docks and slips to be unsafe and in need of extensive repairs, replacement or removal. 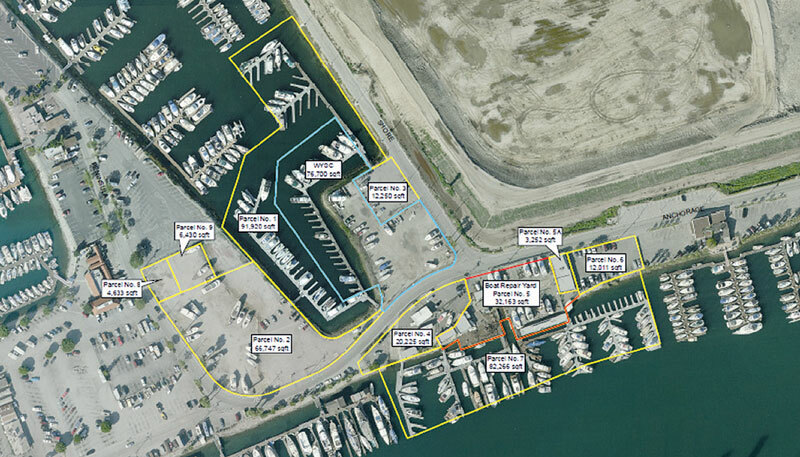 Quick at Cerritos Yacht Anchorage has stated her interest in possibly renovating and upgrading Colonial’s northern slips in Parcel #1 to become a part of Cerritos’ marina. Quick has had a dock planner, electrician and general contractor come out and check the conditions and cost of getting the docks up to code. “It could help grow Cerritos and help with the displacement of some of the Colonial people, but I’m not sure if we can get that plan in action by the time they need to get out,” Quick said. Karkanen said the future use of the marina is not the Port of Los Angeles’ main concern at this time, as it is instead remaining focused on the slip tenants’ removal. If vessels remain on the property following the May 1 deadline, the Harbor Department will begin administering storage fees, which must be paid before the boat can be moved by the owner. If the owner does not pay the storage fees, the vessel could be sold at auction. At press time, the original Colonial Yacht Anchorage owners could not be reached for comment.